I guess you need to understand I’ve been going with my family to his restaurant for almost 15 years. Now my brothers take their families there, too. And I still go there with my mom almost every year when I’m in the U.S. Mind you, I never asked for his recipe. I’m certain his recipe is quite different than this one. And that’s totally cool. This works for me. Everyone I’ve served it to has been impressed. I expect you’ll have the same results. Oh, and if you get to Philadelphia, stop by and tell Ming he’s the best. Mix flour, ground sunflower seeds, nutritional yeast, cornstarch, baking powder, salt in bowl. Add water slowly, stirring constantly to create a smooth, thick but still slightly runny batter. Let sit 10-15 min. Heat oil 2 in / 5 cm deep in a small pot on medium heat. Dip and coat seitan pieces in batter, fry in oil until deep golden brown, 4-6 min, turning as needed. Remove, drip, transfer fried pieces with slotted spoon to plate to be added to sauce later. Heat oil in medium pot on medium heat. Add garlic, spring onions, ginger, chili, coriander, pepper. Fry 2-3 min stirring constantly. Add lemon juice, lemon zest, soy sauce. Stir, fry 1 min. Add 1 cup water, sugar. Stir, return to simmer, reduce heat to low. Cook 5 min partially covered, stirring occasionally. Whisk cornstarch and 1/4 cup water in bowl, add to sauce. Return to simmer, cook partially covered until sauce thickens, about 5 min, stirring occasionally. Add fried seitan pieces, mix well. Simmer for 4-5 min until pieces are soaked with sauce and soften up. Serve on or with jasmine or brown rice, garnished with sesame seeds and chopped spring onions or fresh coriander. Simple sauce: Omit garlic, scallions, chili, coriander, pepper. Substitute 2 Tbsn rice vinegar for lemon juice and zest. Simple batter: Use 1/2 cup flour, omit sunflower seeds and nutritional yeast. Vedic style: Omit onions and garlic. Other options: Substitute chopped red onion for scallions, replace sugar with 1/2 cup chopped pineapple, use chopped cauliflower instead of seitan, orange juice + zest instead of lemon. Experiment! 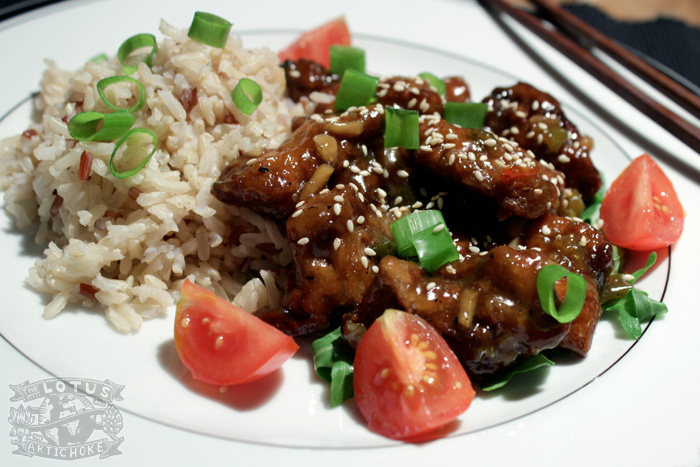 This entry was posted in Chinese and tagged Chinese, general tso's chicken, recipe, seitan, vegan. Bookmark the permalink. This recipe was so great. Thanks! Looking forward to the Cookbook! This was pretty awesome. I used the rice vinegar for the lemon and did not use the sunflower seeds nor the nutritional yeast. Next time I’d thin the batter a little more because I really tasted the batter…perhaps I used too much? Served it with Jasmine rice and steamed broccoli and it was a big hit. Thank you so much for posting this recipe! Also, I was drunk when I made it.